The history of the Belle dates back to the 1950's when founder Doug Blackhurst wanted to buy a cement mixer to help build his new house. No small portable cement mixers existed, so he set about designing one. The result is the now famous Belle Mini Mixer. This fast expanding tool hire business added to the growing demand. After the success of the Mini Mixers, the company began to diversify into other areas of the construction market to compliment its Mixer range. A range of Generators was launched and in 1990 production of the Skid Steer Loader range commenced. Following the death of his father in 1995, Ron Blackhurst as Chairman of Belle Group strategically steered the company towards growth with several acquisitions. This included the opening of a manufacturing facility in Poland. With these acquisitions came an increase in product ranges. 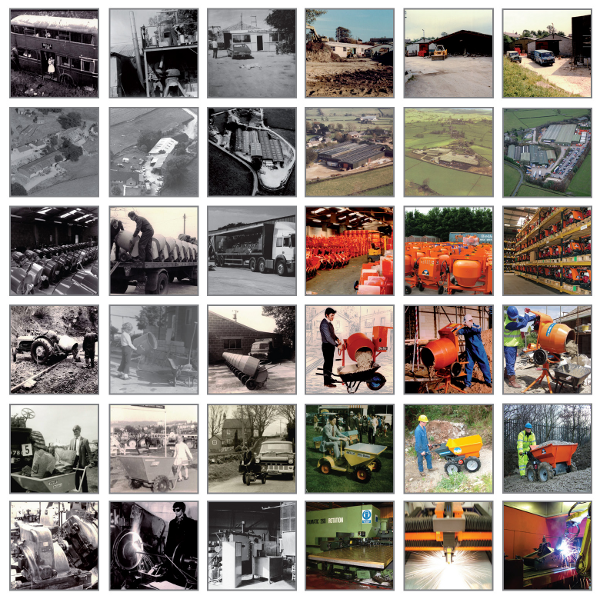 The Group could now offer a wide range of over 100 different types of machinery within the following key areas of construction: Compacting, Mixing, Concreting, Cutting, Breaking & Moving. Although, as part of the restructuring process, it was decided to cease production of the Generators and Skid Steer Loader’s so that more emphasis could be placed on other areas of the business. The company continued to grow, both in the UK and abroad. In 2008, Belle was rewarded for its success in the export market, when the Company was presented with the highly coveted Queen’s Award for Enterprise in International Trade. At the start of 2009 the Altrad Group completed the purchase of the Belle Group, thus ending over 50 years of independent ownership by the Blackhurst family. The portfolio of products ranges now includes Fort, Limex and Richard Wheelbarrows & Plettac Scaffolding. Altrad Belle is now firmly established as a major supplier of an extensive range of lightweight equipment to the construction industry worldwide. Altrad Belle – Equipment Built for the Job!